Action from the Fiji-New Caledonia football match Photo: Anasilini Ratuva. 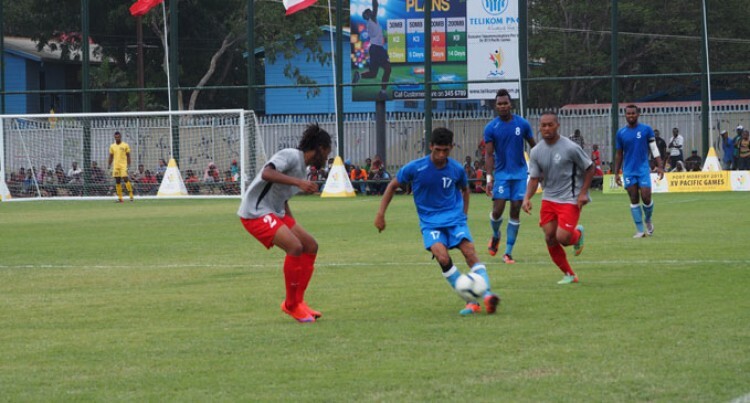 The Fijian Under-23 men’s football side will play Papua New Guinea in the bronze medal playoff at the 2015 Pacific Games. After competing for the Olympic qualifer on Sunday night the Carlos Buzzetti-coached side looked tired. The New Caledonians stuck to their game structures in the first five minutes which saw Jim OUKA fires past Tevita Koroi. New Caledonia continued to dominate as Fiji scored their lone goal in the 34th minute through Napolioni Qasevakatini. New Caledonia played more structured football and scored their second goal just minute to halftime. Haftime: New Caledonia 2-1 Fiji. In the 78th minute the red card was flashed to Fijian captain Jale Dreloa. Fiji will play PNG in a bronze medal playoff on Friday while New Caledonia plays Tahiti for the gold medal.